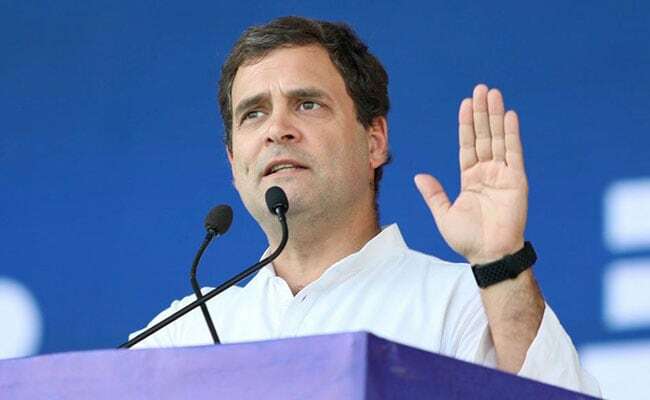 Rahul Gandhi alleges that policies of the Modi government, including crop insurance, were "aimed at taking away hard-earned money of farmers to fill up the pockets of big businessmen"
Taking on Prime Minister Narendra Modi, Congress president Rahul Gandhi today said the Centre's crop insurance scheme is aimed at taking away farmers income to fill up pockets of big businessmen. At his first rally in Bihar after taking over as party president, Mr Gandhi accused the Nitish Kumar government in the state of making "empty promises" like PM Modi. Raising the slogan of "chowkidaar chor hai" (the watchman is the thief) -- an allusion to PM Modi, Rahul Gandhi accused the NDA government at the Centre of committing irregularities in the Rafale deal. He alleged that policies of the Modi government, including crop insurance, were "aimed at taking away hard-earned money of farmers to fill up the pockets of big businessmen". In contrast, he said, his party's governments in Rajasthan, Madhya Pradesh and Chhattisgarh waived farm loans within a few days of coming to power. Besides, alliance partners like RJD's Tejashwi Yadav, former Union minister Sharad Yadav and former Bihar Chief Minister Jitan Ram Manjhi were present.